We’re back!!! Sorry for the long absence. The Valentines holiday takes up a lot of out time and resources. After some recuperation we are starting some specials again. Come in for 25% off your order on red roses. 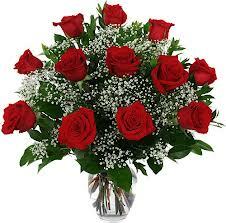 That can be one stem for you to carry out to your honey or 3 dozen designed in a vase for delivery to a business. You chose and we will make it beautiful. This is only while supplies last so hurry in or call to get your 25% discount. Previous post: Special discounts for a limited time.